We celebrate Native American Heritage Month in November to recognize the achievements and contributions of Native Americans. In 1990 President George H. W. Bush approved a joint resolution designating November 1990 “National American Indian Heritage Month.” Similar proclamations, under variants on the name (including “Native American Heritage Month” and “National American Indian and Alaska Native Heritage Month”) have been issued each year since 1994. The National Archives holds hundreds of thousands of related records created or received by the U.S. Government relating to Native Americans. Visit the research portal for American Indian records and view view related records in the National Archives Catalog. Our Native Communities program is an educational resource providing step-by-step instructions for locating important Native American records. We offer hands-on practice, and special Citizen Archivist Missions to make records easily accessible. 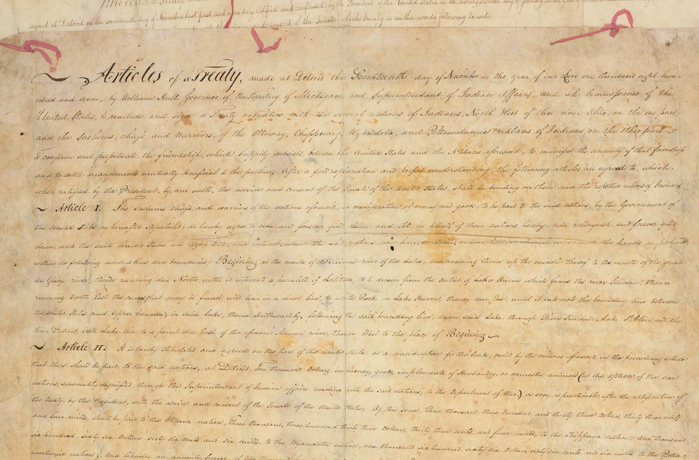 At the end of September, the National Archives at New York City unveiled a new facsimile exhibit, “Be it Remembered: Treaties with Native Nations,” in the lower level of the historic Alexander Hamilton U.S. Custom House at One Bowling Green in lower Manhattan. “New Indian,”1977 - A Native American woman speaks about the American Indian Movement at the Ecumenical Conference of the North Central States. President Andrew Jackson's Message to Congress "On Indian Removal"
National Museum of the American Indian’s “Nation to Nation” exhibition Treaties Between the United States and American Indian Nations. September 21, 2014– 2021, all treaties on loan from the National Archives. Treaty between the Ottawa, Chippewa, Wyandot, and Potawatomi Indians. View in National Archives Catalog. 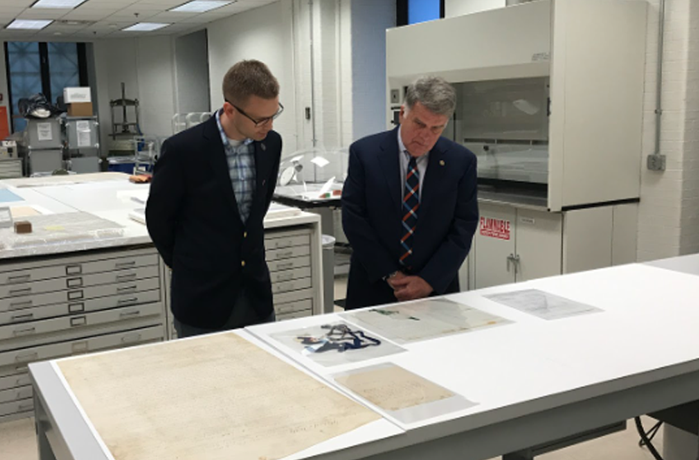 Archivist of the United States David S. Ferriero and Potawatomi Nation Tribal Councilman Alex Warsaw look at Indian Treaties in the conservation lab of the National Archives Building in Washington, DC. Image by Jennifer Miller for NMAI. From left, Elaine Webster of NMAI, joins representatives of the Pokagon Band of Potawatomi Indians to view the Treaty of Fort Wayne, 1809, on loan from the National Archives, at the Smithsonian's National Museum of the American Indian, 2017. 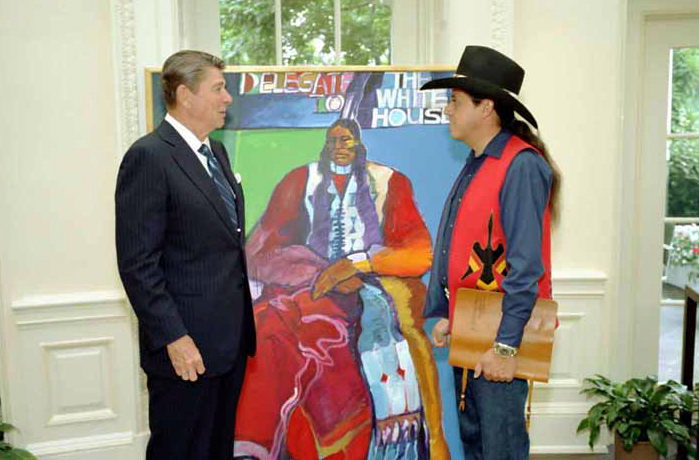 President Reagan receiving a Native American painting from John Nieto in the Oval Office, 1982. President George W. Bush greets Sen. Benjamin Nighthorse Campbell (R-CO) during a ceremony for the opening of the National Museum of the American Indian, 9/23/2004. 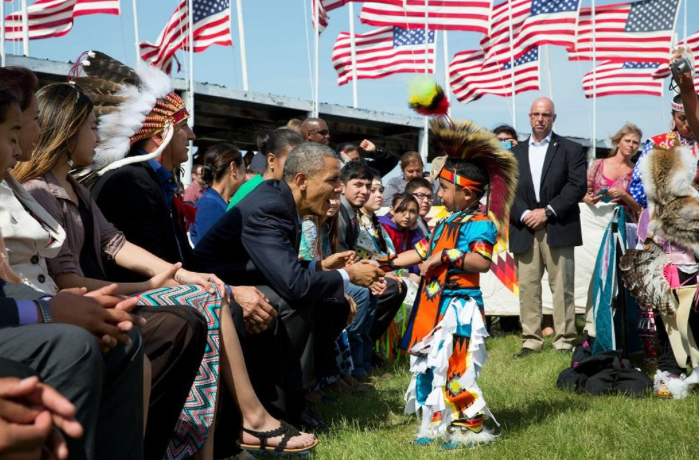 President Barack Obama, with First Lady Michelle Obama, greets a young boy during the Cannon Ball Flag Day Celebration during a visit to the Standing Rock Sioux Tribe Reservation, Cannon Ball, ND, 2014. Courtesy Barack Obama Presidential Library. This page was last reviewed on December 11, 2018.